As the anticipation mounts in the hours before Cryosat-2's launch, project manager Dr Richard Francis shows us around Europe's "mission control"
Europe's Cryosat-2 spacecraft is set to be sent into orbit to assess the state of ice cover at the Earth's poles. The information will help researchers calculate how melting polar ice affects ocean circulation patterns, sea level and global climate. It will launch atop a converted intercontinental ballistic missile from the Baikonur cosmodrome in Kazakhstan. 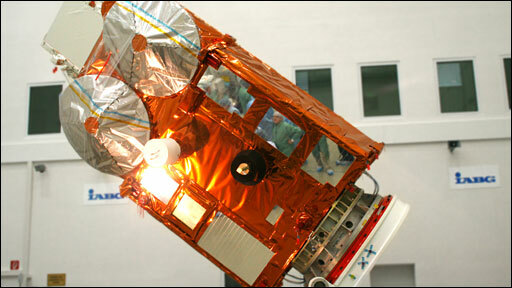 Cryosat-2 is a copy of the spacecraft destroyed in 2005 when its rocket failed five minutes after lift-off. Member states of the European Space Agency (Esa) thought the mission was so important they agreed to rebuild and refly the satellite. The launch is timed for 1357 GMT (1457 BST; 1557 CEST). 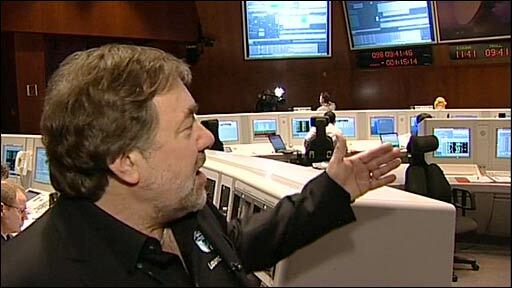 "One will be nervous," said Richard Francis, the Esa Cryosat project manager. "But it will be so exhilarating when the spacecraft finally makes it into orbit and we get the first contact with it, the thing we didn't get the last time." Although built mainly in Germany and France, CryoSat-2 is led scientifically from the UK by its proposer and principal investigator, Professor Duncan Wingham from University College London. The spacecraft will measure very precisely the rates of change of sea and land ice in the Arctic and the Antarctic. A key quest for Cryosat will be to assess the volume of sea ice in the Arctic - something that has been hard to do from space. Satellites have long been used to track ice extent (area), but calculating the thickness of the marine floes requires the overflying spacecraft to gauge the difference between the top of the ice surface and the top of the water - a relatively simple calculation then gives the overall volume. Radar altimeters flown on missions previous to Cryosat have not had the resolution to do this as precisely as researchers would like, and have not flown far enough to the north to get a full view of the Arctic basin. Cryosat, however, will see finer detail, and its "vision" will cover virtually all of the Arctic. Its orbit will leave just a 400km-wide circle at the pole that is out of sight of its instrument. The radar has not one, but two antennas. By listening to the radar echoes with an additional device offset from the first by about a metre, the instrument can sense much better the shape of the ice below, returning more reliable information on slopes and ridges. The Dnepr is a converted nuclear missile that is launched out of a silo. Launch is initiated by firing a black powder charge under the rocket. Expanding gas shoots the vehicle up and out of its air-tight canister. The ejection system's base tray and rings are dropped above the silo. Only when the Dnepr clears the silo are its first-stage motors ignited. This is important for the study of Greenland and Antarctica where past missions have struggled to discern events at the edges of the ice sheets - the very locations where some of the biggest, fastest changes have been taking place. Current assessments of Antarctic ice show some areas thickening and some areas thinning, with zones of rapid ice loss apparent in the West of the continent. During the satellite era, Arctic ice extent has declined at a rate of 11.2% per decade as measured during the warmest summer month, September; and at 2.6% per decade in the coldest winter month, March. Surveys of sea-ice thickness undertaken by submarines suggest ice draft may have reduced by about 40% compared with the 1960s and 1970s. Interestingly, cold temperatures and strong winds saw the area of Arctic Ocean covered in ice this winter reach near-"normal" levels. The complexity of behaviour has proven very difficult to model. "None of the changes that you see [in the Arctic and the Antarctic] are either well modelled, in the case of the Arctic, or modelled at all in the case of the Antarctic," explained Professor Wingham. "We have poor predictive capability in the Arctic and more or less no predictive capability in the Antarctic. "If we wish to know about what is happening in the poles then we have to continue flying these satellites." Cryosat-2 could have been launched about a year ago, but there is a dearth of rockets in the class capable of putting the 720kg spacecraft in orbit. The Dnepr is a modified SS18 ICBM released for civilian operation under the terms of the Strategic Arms Reduction Treaty. Following lift-off from Baikonur, the rocket will fly south, dropping its first stage over Turkmenistan and its second stage over the Indian Ocean. Esa's "mission control" in Darmstadt, Germany, will hope to pick up the satellite via a tracking station in Malindi, Kenya, shortly after separation from the Denpr's third stage, about 17 minutes into the flight. If for some reason Malindi misses Cryosat, there is a second opportunity to make contact using the Norwegian Troll tracking station in Antarctica 31 minutes after launch. Cryosat-2 is part of Esa's Earth Explorer programme - seven spacecraft that will do innovative science obtaining data on issues of pressing environmental concern. The first in the series, Goce (Gravity Field and Steady-State Ocean Circulation), was launched in March last year. The second, the Soil Moisture and Ocean Salinity (Smos) spacecraft, was launched last November.